All aboard the Blog Tour! So, it’s all aboard the Blog Tour as part of #mywritingprocess! We have chugged along the line and stopped at some fantastic places and have now arrived at my little station in the woods thanks to an invite from the ever charming Sally Poyton and you pop over to visit her wonderful blog about books, reading, writing and dyslexia here! Ok, on platform one we have the ever popular question – What are you working on at the moment? At the moment I’m currently working on a YA project about a serial killer, as well as the sequel to my book Brotherhood of Shades. I’m usually working on two or three projects at a time, and a few other side projects as well. I like to keep busy but I think I could do with a holiday at the moment. My favourite project at the moment is not one of my own. I am Author in Residence at a school in Hertfordshire and there is a ten year old girl there who is currently working on an amazing novel and we spend time every week sitting in the school library sounding out her ideas. She is quite remarkable and it is great fun working with her and one day I expect her to say thanks to me by sending her private jet out to fly me to her private island when she is rich and famous. Over to platform two and it’s – How does your work differ from others of its genre? Errr, ummm, it’s written by me? Ok, that’s a bit of a cop out, so let me think…. Ah, I have been told that it is unusual to have your main character die in the opening chapters. He does come back as a ghost so obviously he does need to die first. I’ve always loved ghost stories and really wanted to write a classic ghost story but in a modern setting. Mine is unusual because it does move from the past to the present day, and has a modern feel but touches on historical events like the Great Fire of London. The locations in my book are all real and can be found in London, and there is soon to be a map of the locations so that readers can see if they can find all the places mentioned. Platform three is ready to leave with – Why do you write what you do? Although I write contemporary fantasy, I feel that what I’m actually writing is all about real life (and death!) experiences. When I was a small person I wanted so much to believe that there was more to the world than that which you can see. I wanted to believe that there was another world that operated just outside our reach and that has heavily influenced my writing. I always say that it’s all about the world out of the corner of your eye. I’m sure it’s there, we just need to find a way to see it. Standing room only on platform four as the Blog Tour is almost ready to leave with – How does your writing process work? Well, nothing like ending on a biggie! I know that there is this whole Planner vs Pantster thing, but I’m honestly a bit of both. I don’t have a strict plan but I do rough a lot of the story out and know where it’s going. I often rough out dialogue and even pace out some of the scenes to be sure that they will work. I keep a timeline of events, and a whole mass of post-its with ideas that have popped into my head. A writing day tends to start with me doing my emails and clearing the mental clutter that might rattle around in my head and stop me from concentrating. I do a bit of social networking and read the papers online in this time too, and drink tea. All of this is often done from bed with a biscuit accompaniment as I find this is a good time for consume something for energy (that’s my excuse and I’m sticking to it.) 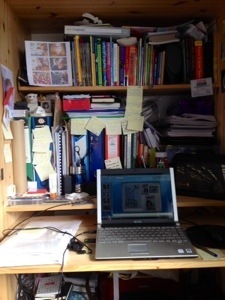 I get to my desk by ten (which is not tricky as it’s only on the other side of the bedroom) and I get on with my work. My desk is in a funny little wardrobe so that I can a) shut it all away at night without having to tidy it up and b)not stare out of the window. I live overlooking a street where something is always happening so it’s not wise to be facing it. When I’m stuck on something I’ll go for a walk, or I’ll get a good long chunk of vital Staring Into Space time in. I do think that a good amount of daydreaming is essential to plot development and so I feel no guilt about sitting in front of a nice breeze watching clouds and trees. I try not to write past eight in the evening, but that’s not always possible if my characters (or deadlines) decide otherwise. I’m just a puppet in their hands and so if they are really nagging me then it is just easier to give them the attention they require rather than fight them. I do write seven days a week, 365 a year. I’m quite bad at taking days off but I’m working on it! Ok, as the last train of the Blog Tour chuffs out of the station with a lonesome whistle and an enigmatic whirl of steam we jump quickly on board and look forward to the next destination. I’m passing my Blog Tour ticket on to one of my favourite writers and illustrators – the completely fantastic Thomas Taylor. Visit his blog and he’ll tell you all about himself, and his latest projects, including (and I’m so excited about this that I can hardly say it…) a collaboration with Marcus Sedgwick. Click on the Scarlett Hart link to find out more. This entry was posted in Interviews, Reading and Readers, Uncategorized, Writers, Writing and tagged blog tour, books, interview, reading, writing, writing process.